Mount Marcy and Adirondacks Adventure! On Saturday evening me and 3 other people set out to reach the highest point in New York State, Mount Marcy. It’s elevation of 5,343 feet didn’t scare us one bit. Getting there wasn’t easy and we made some mistakes that we can now learn from. For one we left at night, that meant leaving from Brooklyn we would get there at about 5:45 am. We only slept for about an hour before getting up again to prepare for our hike. Leaving at night also made it hard to find the Adirondack Lodge (LOJ) that we were supposed to park at for the night and the hike. At 8:45 am we began our ascent, the first two miles was easy and a good warm up. After that things started getting wet and snowy. The more we went the deeper the snow got, until we reached a point where the path was thinning and the snow was just getting deeper. We stopped about a mile after the point where you have a choice to turn off the path for Mount Phelps. That’s where at 4.5 miles we decided to take a rest. A nice amount of hikers were coming back down, we always found this to be the best time for questions. They told us that if we kept going we would be in a fog soon where we wouldn’t be able to see a foot in front of us. We found out that if we did actually get to the top, the view would be non-existent. All we would see is nothing. So we decided to start walking back and climb Mount Phelps. We walked a mile back to that fork in the trail. We sat down and rested a bit, that’s when we met some people coming back from the top of Phelps. They all told us the same, no view and it’s cold. At this point one of our guys told us his feet were starting to freeze. Without the right boots on this trail with all it’s water and snow/ice you can really get wet and cold. So that was pretty much the point where we decided this has been a great adventure that we will never forget. How can we forget step after step in mud, ice, snow. Slipping on rocks. Practically walking the trail which turned into a stream. Once in a while a pile of snow falls down from the trees because of the wind, these blocks of snow fall on your head without warning. At the same time that you are freezing because of the cold, you find yourself taking off your gloves and jacket because you are sweating from all the climbing. Now it’s true that we were not very well prepared and that this was pretty new to us but the snow was really making it too difficult for people who had no sleep and too many layers. I’ve learned that you need to come with light but warm clothing. Don’t drive all night and expect to climb 5,343 feet with no sleep. After we came back we decided to start driving around. 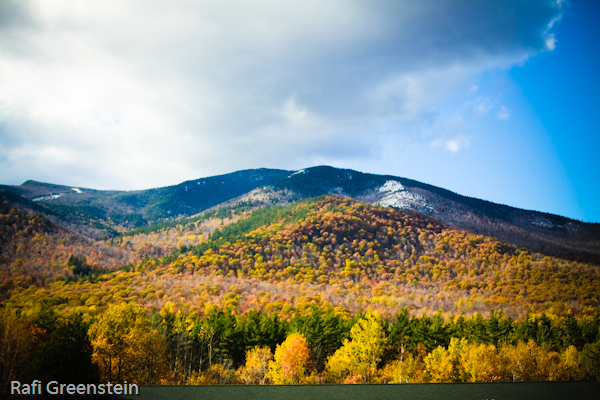 I got some nice shots of the Adirondack scenery. That’s pretty much it for this adventure. We hope to tackle this mountain again around summer time. Climbing/Hiking is something I do enjoy and would like to continue learning.